With the growing use of foam plastic insulation in building construction, first in commercial roofing and then too often metastasizing over the entire building enclosure, it is being used increasingly as an air barrier component. 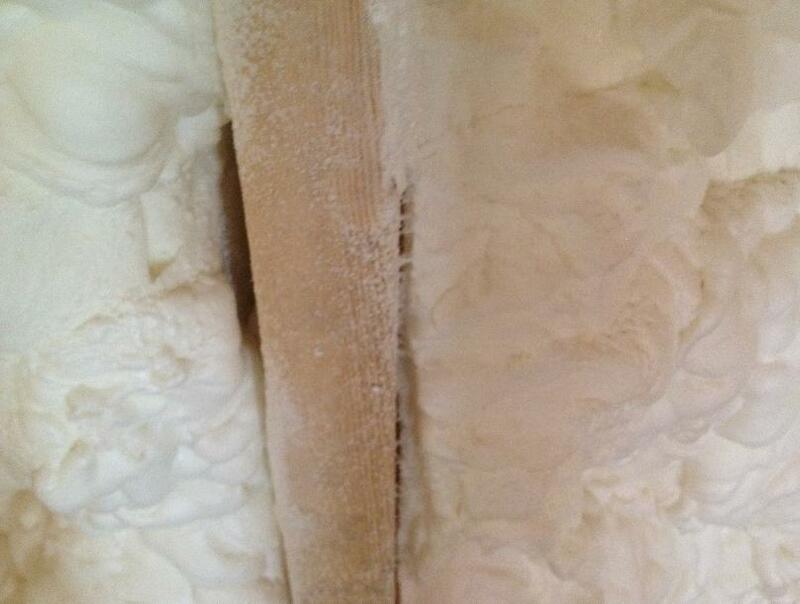 This is a problem for many reasons - see Foam Fails - and one of them is excessive shrinkage. Essential to maintaining airtightness is maintaining airtight connections between the building components and materials that make up the continuous air barrier: plywood, membranes, tapes etc... Continuity is king. Yet many forces work against the reign of continuity: bad detailing, poor application of materials, plumbers with disregard for airtightness that tear through air barriers, and so on. It can be difficult. To make airtightness more assured we want to select those materials that are the most robust, the most airtight; they may be flexible, or rigid depending on the specific application. In all cases we strive for materials that are dimensionally stable - moving in only predicable and useful ways that support airtightness. 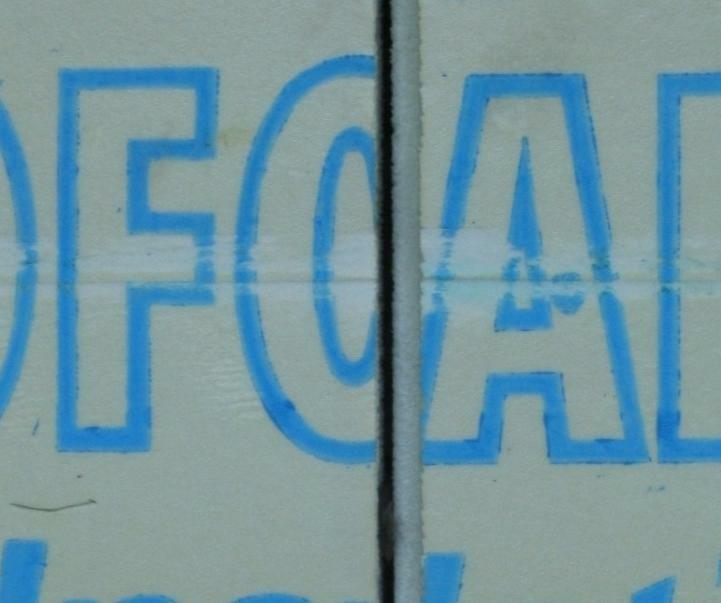 Foam does not do this. Foam shrinks unpredictably and excessively, compromising the air barrier continuity. Foam fails. 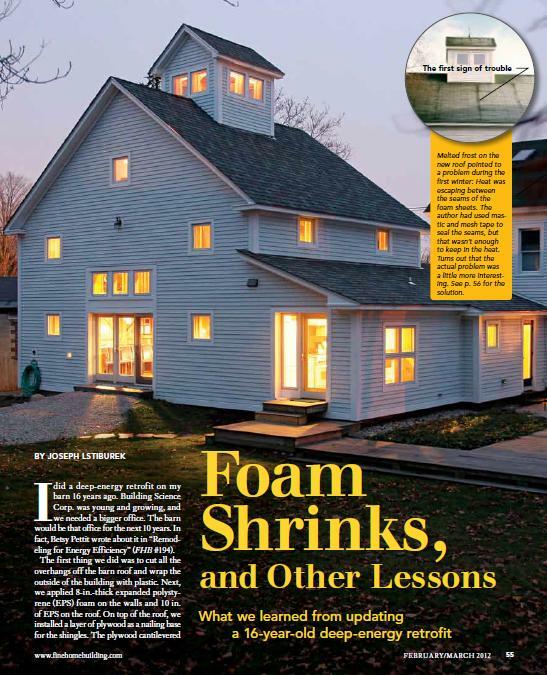 Famously, Building Science Corporation's Joe Lstiburek declared "Foam Shrinks" in a Feb/March 2012 Fine Homebuilding Article. In a lesson to many of his building science classes, Joe tells the now classic story of how the thick foam panels on his "barn" roof shrank. He wasn't relying on the foam for airtightness, but the thermal performance of the foam was degraded. A couple of months later, in May 2012, Joe clarified his statement saying that it wasn't an issues of dimensional stability but cycles of contraction and expansion - that all materials, including foam, shrink and expand in different environmental conditions. Regarding dimensional stability, Dow Styrofoam XPS, states that the maximum shrinkage that can be expected is 2%. Over a 96" long board that's 1.9 inches. Really. (Tape might not help in this case; it would seal the join but probably would tear the foam - better use a ProClima membrane in that case). Martin Holladay answered on a GreenBuildingAdvisor Q & A: "Foam manufacturers have said that the [sic] continually improve their manufacturing methods to minimize shrinkage problems. Only time will tell whether today's panels are less likely to shrink than the panels of the past." The only constant appears to be that the chemical companies are continuously reformulating - without any clear declarations of the reformulated results. So while the chemical companies may talk about improved performance, the 2% number is still their printed claim. Spray foam in particular has been sold as a thermal insulator and air barrier in one. But once installed, spray foam, similar to foam boards, will expand and shrink over time. And both open and closed cell spray foam can and do regularly shrink and pull away from other air barrier components. The air barrier continuity is lost resulting in failure - leaks, drafts, discomfort, energy loss. It has been said repeatedly by the spray foam industry and those repeating the chemical companies that "this is not a problem of spray foam, it's a problem of the installer's workmanship!" We ask: So what? The job's a failure. In an age when we know we should be moving as much construction into factory environments for better quality control, why would anyone purposefully move manufacturing from the factory to the job site? Who needs to make these problems and this worry? Lose the shrinkage. Lose the foam.